In 1981 I began making documentaries in Kenya's Masai Mara. For a film maker trying to capture high action sequences of predators hunting, the Mara was simply the best place in Africa. On one day, myself and Warren Samuels achieved a cheetah kill, lion kill and crocodile killing zebra. All three sequences were truly dramatic. On my arrival in the Mara, I applied my knowledge that I had learned from the ecologist Dr Ken Tinley.I went into partnership with the Masai people and even partly owned a herd of 240 cows. The Masai had previously been pastoralists moving nomadically across the land. Now they were settled in one area and the cattle grazed around their homesteads, often overgrazing the land. Tourism was strong and many lodges and tented camps were dotted across the Mara. I noticed that the lodges did not employ the Masai. The Masai were regarded as too wild, too unreliable to work in a game lodge. The result was that the lodge owners brought their staff from Nairobi to run their lodges. Therefore many Kikuyu and other tribes worked in the Mara, depriving the Masai of jobs. The Masai perceived tourism as a necessary evil on their land. Except for the camp site fees, they derived no benefits from the tourism. There was always conflict, the tourist lions would attack the Masai cattle, the Masai would retaliate and kill the lions, robbing the lodge owners of a major tourist attraction. The star of the BBC series "Big Cat Diary", Half Tail the leopard, was killed by the Masai after she began killing goats. In the film, "Brothers in Arms", I predicted that if the Masai were not brought into the mainstream tourist industry, the Masai Mara would suffer the consequences in the future. My prediction has come to pass and more and more conflict has developed between the Masai and the tourist industry. Recently, members of the famous "Marsh Pride", one of the biggest tourist attractions in the Masai Mara, were poisoned by Masai herdsmen. Rhino and elephant have both suffered at the hands of the Masai. Nearby in Amboseli, the Masai have been spearing elephant and the elephants are retaliating by killing Masai. Like in any conflict situation, there are those that will exploit it, namely the poaching syndicates. Poverty, marginalized communities shut out of the park system provide the perfect environment for syndicates to operate. The syndicates provide guns and ammunition and pay large amounts of money for ivory and rhino horn. Now the people shut out of the park system benefit directly, albeit illegally. Only Ian Khama of the African leaders has been able to combat the poaching. Khama's "shoot to kill policy" and zero tolerance has paid dividends. While other African countries are losing rhino, Ian Khama is restocking Botswana with rhino sourced from South Africa. In short, Ian Khama's military approach has worked. No country in Africa has been able to combat poaching, by using communities loyal to the parks. 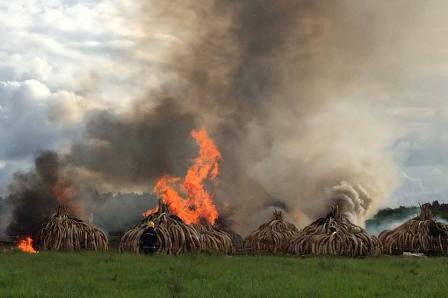 Uhuru Kenyatta's approach has been to torch 110 tons of ivory and over 1 ton of rhino horn. Kenyatta believes if he can kill the supply, he can win the war against poaching. However to be fully successful, Kenyatta will have to win the war against poaching on the ground, a time consuming and costly business. Whether you are an advocate for trading ivory and rhino horn or not, it is perfectly obvious in which direction the world is heading. 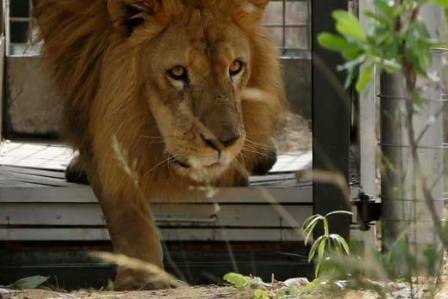 On the same day that Kenyatta torched 110 tons of ivory, 33 lions were being flown into South Africa from circuses and zoos that have been closed down in Peru and Columbia. Canned lion hunting, trophy hunting, trade in ivory and rhino horn and wild animals performing in circuses are under pressure worldwide. Social media today is a powerful force across the globe. People are able to communicate instantly with pictures, Facebook, YouTube, Email, Instagram and Twitter. If the circus is in town and has performing wild animals, boycott it. Don't buy from shops trading in any kind of ivory or wild animal fur coats. Boycott hamburger producers that have been known to destroy rain forests. You have cameras and you have the ability to communicate your pictures and your concerns world wide. Use them!! On the same day that the ivory was being burned and the lions were being flown from Peru, we were introducing 6 serval into the cheetah area at Tiger Canyons. 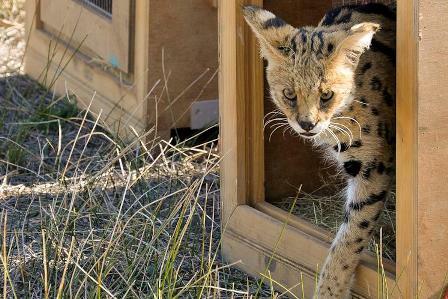 Several sightings have been made and one particular serval that was hand raised allows people to walk and hunt with him. 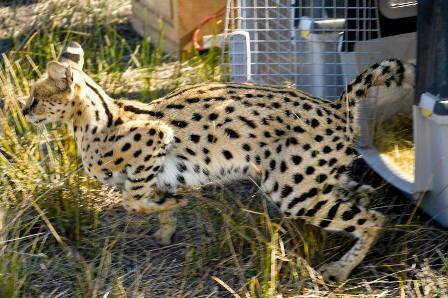 I would like to thank Will van Duyn, Yuku Lehara, George Snyman and Lizelle Liebenberg for their assistance in the capture and transportation of the Serval. Bush School: Where are they now? Mirror mirror on the wall, who has the best eyesight of them all? Mirror, mirror on the wall, who is the fastest of them all? Mirror, mirror on the wall, who is the best fighter of them all? What price must beauty pay?